Not to be confused with Mount Elbrus. Mount Erebus ( /ˈɛrɪbəs/ ) is the second-highest volcano in Antarctica (after Mount Sidley) and the southernmost active volcano on Earth. It is the sixth-highest ultra mountain on the continent. With a summit elevation of 3,794 metres (12,448 ft), it is located in the Ross Dependency on Ross Island, which is also home to three inactive volcanoes: Mount Terror, Mount Bird, and Mount Terra Nova. 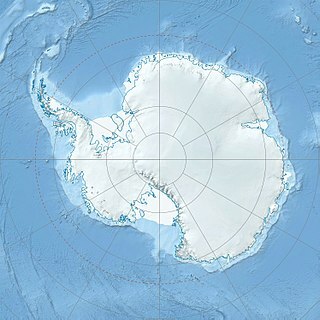 Mount Sidley is the highest dormant volcano in Antarctica, a member of the Volcanic Seven Summits, with a summit elevation of 4,181–4,285 metres (13,717–14,058 ft). It is a massive, mainly snow-covered shield volcano which is the highest and most imposing of the five volcanic mountains that comprise the Executive Committee Range of Marie Byrd Land. The feature is marked by a spectacular 5 km wide caldera on the southern side and stands NE of Mount Waesche in the southern part of the range. The volcano was the site of the Air New Zealand Flight 901 accident, which occurred in November 1979. Air New Zealand Flight 901 (TE-901) was a scheduled Air New Zealand Antarctic sightseeing flight that operated between 1977 and 1979. The flight would leave Auckland Airport in the morning and spend a few hours flying over the Antarctic continent, before returning to Auckland in the evening via Christchurch. On 28 November 1979, the fourteenth flight of TE-901, a McDonnell Douglas DC-10-30, registration ZK-NZP, flew into Mount Erebus on Ross Island, Antarctica, killing all 237 passengers and 20 crew on board. 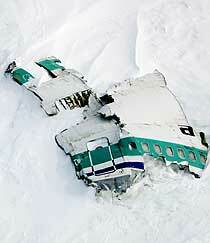 The accident became known as the Mount Erebus disaster. Mount Erebus is currently the most active volcano in Antarctica and is the current eruptive zone of the Erebus hotspot. The summit contains a persistent convecting phonolitic lava lake, one of five long-lasting lava lakes on Earth. Characteristic eruptive activity consists of Strombolian eruptions from the lava lake or from one of several subsidiary vents, all within the volcano's inner crater. The volcano is scientifically remarkable in that its relatively low-level and unusually persistent eruptive activity enables long-term volcanological study of a Strombolian eruptive system very close (hundreds of metres) to the active vents, a characteristic shared with only a few volcanoes on Earth, such as Stromboli in Italy. Scientific study of the volcano is also facilitated by its proximity to McMurdo Station (U.S.) and Scott Base (New Zealand), both sited on Ross Island around 35 km away. The Erebus hotspot is a volcanic hotspot responsible for the high volcanic activity on Ross Island in the western Ross Sea of Antarctica. Its current eruptive zone, Mount Erebus, has erupted continuously since its discovery in 1841. Phonolite is an uncommon extrusive rock, of intermediate chemical composition between felsic and mafic, with texture ranging from aphanitic (fine-grain) to porphyritic. Its intrusive equivalent is nepheline syenite. Lava lakes are large volumes of molten lava, usually basaltic, contained in a volcanic vent, crater, or broad depression. The term is used to describe both lava lakes that are wholly or partly molten and those that are solidified. A polygenetic volcanic field is a group of polygenetic volcanoes, each of which erupts repeatedly, in contrast with monogenetic volcanoes, each of which erupts only once. Polygenetic volcanic fields generally occur where there is a high-level magma chamber. These volcanic fields may show lithological discontinuities due to major changes in magma chemistry, volcanotectonic events, or long erosional intervals, and may last over 10 million years. Lava flows of more viscous phonotephrite and trachyte erupted after the basanite. The upper slopes of Mount Erebus are dominated by steeply dipping (about 30°) tephritic phonolite lava flows with large-scale flow levees. A conspicuous break in slope around 3,200 m ASL calls attention to a summit plateau representing a caldera. The summit caldera was created by an explosive VEI-6 eruption that occurred 18,000 ± 7,000 years ago. It is filled with small volume tephritic phonolite and phonolite lava flows. In the center of the summit caldera is a small, steep-sided cone composed primarily of decomposed lava bombs and a large deposit of anorthoclase crystals known as Erebus crystals. The active lava lake in this summit cone undergoes continuous degassing. Strike and dip refer to the orientation or attitude of a geologic feature. The strike line of a bed, fault, or other planar feature, is a line representing the intersection of that feature with a horizontal plane. On a geologic map, this is represented with a short straight line segment oriented parallel to the strike line. Strike can be given as either a quadrant compass bearing of the strike line or in terms of east or west of true north or south, a single three digit number representing the azimuth, where the lower number is usually given, or the azimuth number followed by the degree sign. A caldera is a large cauldron-like hollow that forms following the evacuation of a magma chamber/reservoir. When large volumes of magma are erupted over a short time, structural support for the crust above the magma chamber is lost. The ground surface then collapses downward into the partially emptied magma chamber, leaving a massive depression at the surface. Although sometimes described as a crater, the feature is actually a type of sinkhole, as it is formed through subsidence and collapse rather than an explosion or impact. Only seven known caldera-forming collapses have occurred since the start of the 20th century, most recently at Bárðarbunga volcano in Iceland. 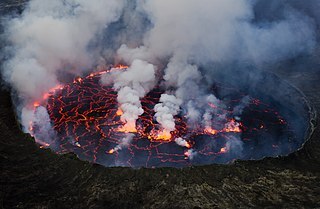 Researchers spent more than three months during the 2007–08 field season installing an unusually dense array of seismometers around Mount Erebus to listen to waves of energy generated by small, controlled blasts from explosives they buried along its flanks and perimeter, and to record scattered seismic signals generated by lava lake eruptions and local ice quakes. By studying the refracted and scattered seismic waves, the scientists produced an image of the uppermost (top few km) of the volcano to understand the geometry of its "plumbing" and how the magma rises to the lava lake. These results demonstrated a complex upper-volcano conduit system with appreciable upper-volcano magma storage to the northwest of the lava lake at depths hundreds of meters below the surface. Mt. Erebus is notable for its numerous ice fumaroles – ice towers that form around gases that escape from vents in the surface. The ice caves associated with the fumaroles are dark, in polar alpine environments starved in organics and with oxygenated hydrothermal circulation in highly reducing host rock. The life is sparse, mainly bacteria and fungi. This makes it of special interest for studying oligotrophs – organisms that can survive on minimal amounts of resources. The caves on Erebus are of special interest for astrobiology, as most surface caves are influenced by human activities, or by organics from the surface brought in by animals (e.g. bats) or ground water. The caves at Erebus are at high altitude, yet accessible for study. Almost no chance exists of photosynthetic-based organics, or of animals in a food chain based on photosynthetic life, and no overlying soil to wash down into them. Mount Erebus is large enough to have several named features on its slopes, including a number of craters and rock formations. Upper “Summit Camp” site (HSM 89) consists of part of a circle of rocks, which were probably used to weight the tent valances. Lower “Camp E” site (HSM 90) consists of a slightly elevated area of gravel, as well as some aligned rocks, which may have been used to weight the tent valances. In 1992, the inside of the volcano was explored by Dante I, an eight legged tethered robotic explorer. Dante was designed to acquire gas samples from the magma lake inside the inner crater of Mount Erebus to understand the chemistry better through the use of the on-board gas chromatograph, as well as measuring the temperature inside the volcano and the radioactivity of the materials present in such volcanoes. 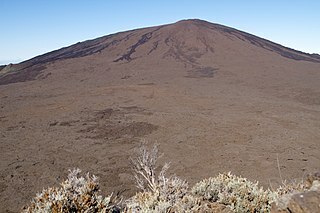 Dante successfully scaled a significant portion of the crater before technical difficulties emerged with the fibre-optic cable used for communications between the walker and base station. Unfortunately, Dante I had not yet reached the bottom of the crater, so no data of volcanic significance was recorded. However, the expedition proved to be highly successful in terms of robotic and computer science, and was possibly the first expedition by a robotic platform to Antarctica. Mount St. Helens is an active stratovolcano located in Skamania County, Washington, in the Pacific Northwest region of the United States. It is 50 miles (80 km) northeast of Portland, Oregon and 96 miles (154 km) south of Seattle, Washington. 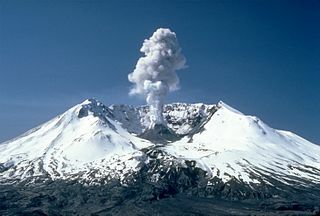 Mount St. Helens takes its English name from the British diplomat Lord St Helens, a friend of explorer George Vancouver who made a survey of the area in the late 18th century. The volcano is located in the Cascade Range and is part of the Cascade Volcanic Arc, a segment of the Pacific Ring of Fire that includes over 160 active volcanoes. This volcano is well known for its ash explosions and pyroclastic flows. Newberry Volcano is a large active shield-shaped stratovolcano located 35 miles (56 km) east of the major crest of the Cascade Range and about 20 miles (32 km) south of Bend, Oregon, within the Newberry National Volcanic Monument. Its highest point is Paulina Peak. The largest volcano in the Cascade Volcanic Arc, Newberry has roughly the same area as the state of Rhode Island at 1,200 square miles (3,100 km2) when its lava flows are taken into account. From its northernmost to southernmost point, the volcano has a length of 75 miles (121 km), with a width of 27 miles (43 km) and a total volume of approximately 120 cubic miles (500 km3). It was named for the geologist and surgeon John Strong Newberry, who explored central Oregon for the Pacific Railroad Surveys in 1855. The surrounding area has been inhabited by Native American populations for more than 10,000 years. Mount Thielsen, or Big Cowhorn, is an extinct shield volcano in the Oregon High Cascades, near Mount Bailey. Because eruptive activity ceased 250,000 years ago, glaciers have heavily eroded the volcano's structure, creating precipitous slopes and a horn-like peak. The spire-like shape of Thielsen attracts lightning strikes and creates fulgurite, an unusual mineral. The prominent horn forms a centerpiece for the Mount Thielsen Wilderness, a reserve for recreational activities such as skiing and hiking. Mount Mazama is a complex volcano in the Oregon segment of the Cascade Volcanic Arc and the Cascade Range, in the United States, that was destroyed due to a major eruption that took place 7,700 years ago. Located in Klamath County, the volcano resides 60 miles (97 km) to the north of the border between Oregon and California in the southern Cascades. Its collapsed caldera holds Crater Lake, and the entire mountain is located within Crater Lake National Park. Mazama has an elevation of 8,157 feet and Crater Lake reaches a depth of 1,943 feet (592 m), making it the deepest freshwater body in the United States and the second deepest in North America after Great Slave Lake in Canada. Mount Katmai is a large stratovolcano on the Alaska Peninsula in southern Alaska, located within Katmai National Park and Preserve. It is about 6.3 miles (10 km) in diameter with a central lake-filled caldera about two by three miles in size, formed during the Novarupta eruption of 1912. The caldera rim reaches a maximum elevation of 6,716 feet (2,047 m). 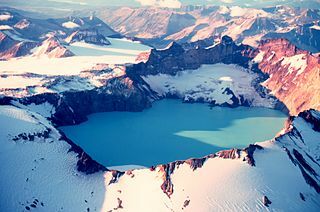 In 1975 the surface of the crater lake was at an elevation of about 4,220 feet (1,286 m), and the estimated elevation of the caldera floor is about 3,400 ft (1,040 m). The mountain is located in Kodiak Island Borough, very close to its border with Lake and Peninsula Borough. Mount Spurr is a stratovolcano in the Aleutian Arc of Alaska, named after United States Geological Survey geologist and explorer Josiah Edward Spurr, who led an expedition to the area in 1898. The Alaska Volcano Observatory (AVO) currently rates Mount Spurr as Level of Concern Color Code Green. The mountain is known aboriginally by the Dena'ina Athabascan name K'idazq'eni, literally 'that which is burning inside'. Mount Berlin is the sixth highest volcano in Antarctica, located 16 km west of Mount Moulton in Marie Byrd Land near the eastern coast of the Ross Sea. It is composed of two coalesced shield volcanoes: Merrem Peak and Berlin Crater. The volcanic structure is considered active, as steaming fumaroles have been observed near the rim of the northern and western calderas, producing fumarolic ice towers. Mount Siple is a potentially active Antarctic shield volcano, rising to 3,110 metres (10,203 ft) and dominating the northwest part of Siple Island, which is separated from the Bakutis Coast, Marie Byrd Land, by the Getz Ice Shelf. Its youthful appearance strongly suggests that it last erupted in the Holocene. It is capped by a 4-by-5-kilometre summit caldera, and tuff cones lie on the lower flanks. Recely Bluff is on the northeast slope of the mountain, about 7 nautical miles (13 km) from the peak. Its volume of 1,800 cubic kilometres (430 cu mi) is comparable to that of Mount Erebus. Several types of volcanic eruptions—during which lava, tephra, and assorted gases are expelled from a volcanic vent or fissure—have been distinguished by volcanologists. These are often named after famous volcanoes where that type of behavior has been observed. Some volcanoes may exhibit only one characteristic type of eruption during a period of activity, while others may display an entire sequence of types all in one eruptive series. Mount Haddington is a massive 1,630 m (5,350 ft) high shield volcano comprising much of James Ross Island in Graham Land, Antarctica. It is 60 km (37 mi) wide and has had numerous subglacial eruptions throughout its history, forming many tuyas. Some of its single eruptions were bigger in volume than a whole normal-sized volcano. Old eruption shorelines are widespread on the volcano's deeply eroded flanks. 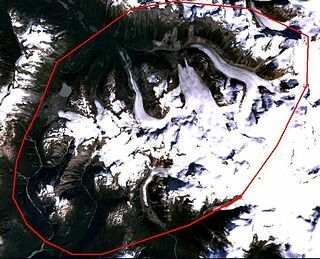 The Mount Edziza volcanic complex is a large and potentially active north-south trending complex volcano in Stikine Country, northwestern British Columbia, Canada, located 38 kilometres (24 mi) southeast of the small community of Telegraph Creek. It occupies the southeastern portion of the Tahltan Highland, an upland area of plateau and lower mountain ranges, lying east of the Boundary Ranges and south of the Inklin River, which is the east fork of the Taku River. As a volcanic complex, it consists of many types of volcanoes, including shield volcanoes, calderas, lava domes, stratovolcanoes, and cinder cones. The volcanic history of the Northern Cordilleran Volcanic Province presents a record of volcanic activity in northwestern British Columbia, central Yukon and the U.S. state of easternmost Alaska. The volcanic activity lies in the northern part of the Western Cordillera of the Pacific Northwest region of North America. Extensional cracking of the North American Plate in this part of North America has existed for millions of years. Continuation of this continental rifting has fed scores of volcanoes throughout the Northern Cordilleran Volcanic Province over at least the past 20 million years and occasionally continued into geologically recent times. 1 2 3 "Mount Erebus". Global Volcanism Program . Smithsonian Institution . Retrieved 2008-12-29. ↑ "Mount Erebus". Geographic Names Information System . United States Geological Survey . Retrieved 2011-07-30. ↑ "Antarctic explorers". Australian Antarctic Division. Retrieved 2008-12-29. ↑ "Mt. Erebus". Mt. Erebus Volcano Observatory (MEVO). Archived from the original on March 12, 2012. Retrieved January 11, 2015. ↑ "Mount Erebus Volcano Observatory". New Mexico Tech. Archived from the original on 2007-07-02. Retrieved 2008-12-29. ↑ "Plumbing Erebus: Scientists use seismic technique to map interior of Antarctic volcano". ↑ Zandomeneghi, D.; Aster, R.; Kyle, P.; Barclay, A.; Chaput, J.; Knox, H. (2013). "Internal structure of Erebus volcano, Antarctica imaged by high-resolution active-source seismic tomography and coda interferometry". Journal of Geophysical Research . 118 (3): 1067–1078. doi:10.1002/jgrb.50073. ↑ Tebo, Bradley M.; Davis, Richard E.; Anitori, Roberto P.; Connell, Laurie B.; Schiffman, Peter; Staudigel, Hubert (2015). "Microbial communities in dark oligotrophic volcanic ice cave ecosystems of Mt. Erebus, Antarctica". Frontiers in Microbiology. 6. doi:10.3389/fmicb.2015.00179. ISSN 1664-302X. ↑ Wall, Mike. "Antarctic Cave Microbes Shed Light on Life's Diversity". Livescience. ↑ "Side Crater". Geographic Names Information System . United States Geological Survey . Retrieved 2018-07-27. ↑ "Western Crater". Geographic Names Information System . United States Geological Survey . Retrieved 2019-01-11. ↑ "Nausea Knob". Geographic Names Information System . United States Geological Survey . Retrieved 2019-01-11. ↑ "Tarr Nunatak". Geographic Names Information System . United States Geological Survey . Retrieved 2019-01-11. ↑ "Seismic Bluff". Geographic Names Information System . United States Geological Survey . Retrieved 2019-01-11. ↑ "List of Historic Sites and Monuments approved by the ATCM (2013)" (PDF). Antarctic Treaty Secretariat. 2013. Retrieved 2014-01-09. ↑ Mear, Roger and Robert Swan, In the Footsteps of Scott, pp. 95–104. ↑ Wheeler, Sara. Terra Incognita. ↑ Johnson, Nicholas. Big Dead Place. ↑ Wettergreen, David; Chuck Thorpe; William Whittaker (1993). "Exploring Mount Erebus by Walking Robot". International Conference of Intelligent Autonomous Systems: 72–81. Wikimedia Commons has media related to Mount Erebus .